It was entirely appropriate that on 1 July 2016, the 100th anniversary of the start of the Battle of the Somme, Welsh National Opera should bring their staging of Iain Bell's new opera In Parenthesis to Covent Garden. 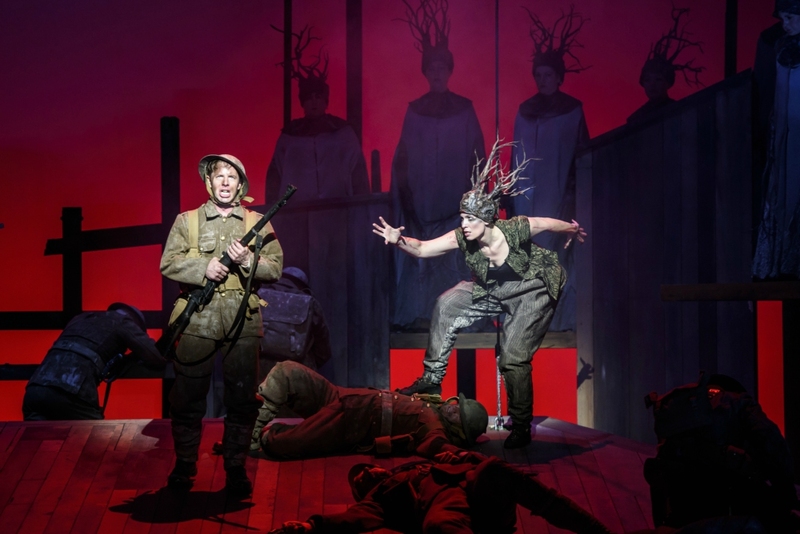 The opera sets a libretto by David Antrobus and Emma Jenkins based on David Jones' great poetic World War One memoir In Parenthesis, which mixes realistic detail with a vein of mysticism. Conducted by Carlo Rizzi, directed by David Pountney and designed Robert Innes Hopkins, with Andrew Bidlack, Peter Coleman-Wright, Alexandra Deshorties, George Humphreys, Marcus Farnsworth, Mark le Brocq, Donald Maxwell, Joe Roche, Martin Lloyd, Simon Crosby Buttle and Graham Clark. 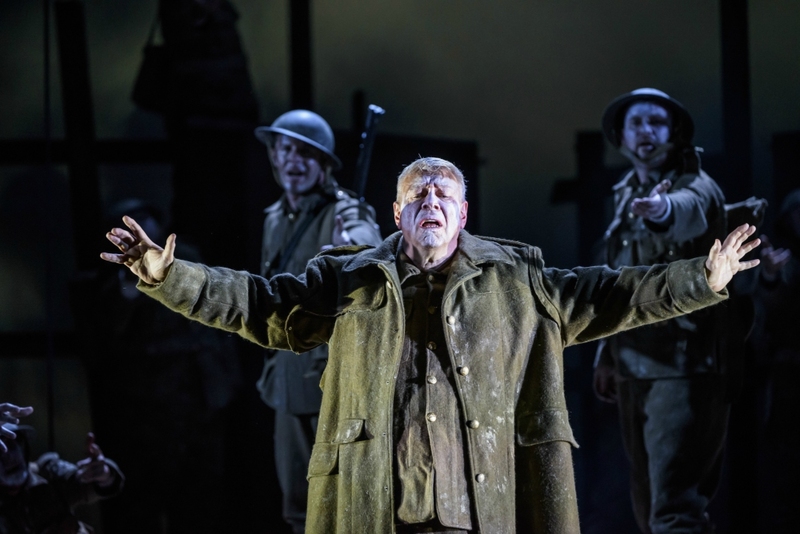 In an article in the programme book David Antrobus and Emma Jenkins talk about their adaptation of Jones' poem, saying that "David Jones' text is so musical, so mellifluous, so evocative of a textured soundscape that we were convinced this would be a gift to any composer'. Frankly this rang alarm bells even before I had heard a note of music and seemed a long way from the comments by Martin Crimp (librettist of George Benjamin's two operas) about the libretto having something missing so that it leaves space for the music. 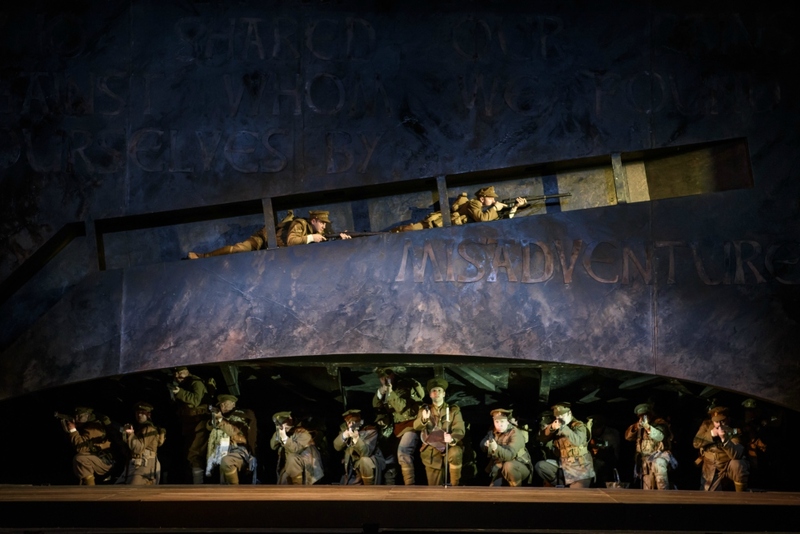 The opera opens with an act of remembrance, as the bard of Britannia (Peter Coleman-Wright) and bard of Germania (Alexandra Deshorties) with a female chorus of remembrance, contemplate what has happened, 'the many men so beautiful' who died. Iain Bell has gone to some trouble to write lyrically impassioned music, using the large orchestra to create a richly textured support for lovely lines for the singers but there seemed just too much text. It came over as rather wordy (and the words did not really come over, we had to rely on the surtitles). More than this, the two characters of the bards (he dressed as a padre she as an Edwardian lady) worried me. The idea comes from one of David Jones' paintings, not from his In Parenthesis and throughout the action the two bards placed themselves between the main action and us, guiding it and interpreting it to us. This role was amplified by the female chorus (also dressed in sub-Edwardian lady clothes). I found this effect a bit too distancing and felt that it was something of a cop-out on the part of the librettists, almost saying that David Jones' poem was untranslatable into an operatic dramatic genre (probably true) and that something new needed to be invented. The main action interweaves the events leading up to the Somme from the point of view of Private John Ball (Andrew Bidlack), a young recruit to the Royal Welch Fusiliers. We had realistic soldiery with lots of demotic from the troops (a strong ensemble with George Humphreys as Lieutenant Jenkins, Marcus Farnsworth as Lance Corporal Lewis, Marc le Broq as Sergeant Snell, Donald Maxwell as Dai Greatcoat, Joe Roche as Private Watcyn, Martin Lloyd as Private Wastebottom, Simon Crosby Buttle as Runner and Graham Clark as the Marne Sergeant), which Bell enlivened with humour, hymns, fanfares, marches and Welsh songs. For me, one of the most moving moments in the opera was when the men break into the Welsh folk-song 'Sosban fach'. But threading through this realism was Private Ball's tendency to go into mystical transports, linking the action in the trenches to past history, Welsh epics such as 'Y Gododdin' and even Uther Pendragon makes a brief appearance. Bidlack was brilliant in the intense solos which Bell had written for him. Bidlack is a young American lyric tenor and the contrarian in me thought it a shame that for WNO's 70th anniversary celebrations a young Welsh tenor could not have been found. You sensed that the music took Bidlack to his limits, but was completely unstinting and wonderfully intense in these mystical moments, whilst delightfully hopeless in real life. Even here, you were aware of the sheer strength of David Jones' words which threatened to overpower the music. When Mametz Wood was reached in the second act, then things rather took off. There was more space for Iain Bell's music as he needed to describe and evoke the terrible events of the battle for Mametz Wood, entwined with the sense of the mystic as the Queen of the Wood (Alexandra Deshorties) and the chorus of Dryads brought death and destruction to the men. At the end, Iain Bell's music did fine justice to David Jones' strange mystical vision of the Queen of the Wood garlanding the dead men with flowers and greenery, bringing regeneration. 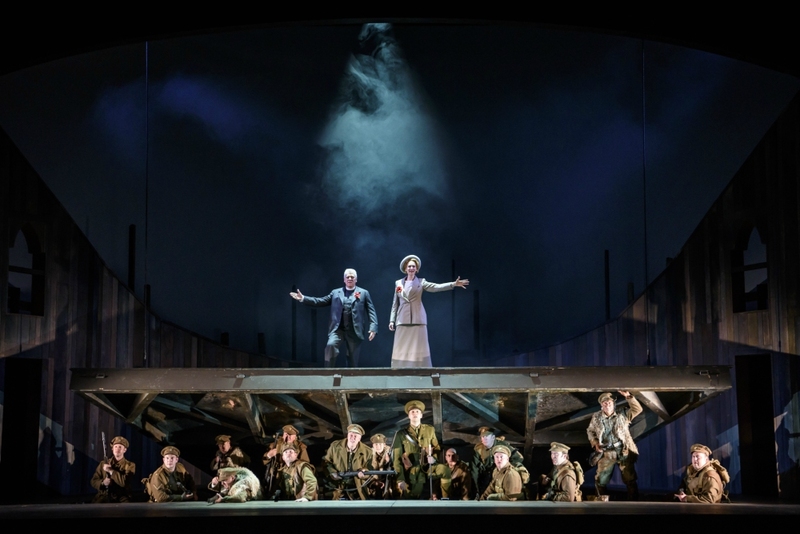 But this scene also emphasised the strangeness of David Pountney and Robert Innes Hopkins' decision to keep the visual world within the sub-Edwardian style of the period. The female chorus came out dressed in long period dresses and great picture hats covered with flowers, and it was these hats which were laid on the men almost as wreaths. Simply I wanted a greater sense of other-ness and less cosy sub-Edwardian conventionality. The opera received a strong performance from all concerned. Though the male soloists in the troop each got their solo moment, it was very much as an ensemble that we perceived them and they created a strong feel, so much so that it took some time for me to identify the different soloists. Alexandra Deshorties really came into her own on Act Two when, as the Queen of the Wood, Iain Bell wrote some fearful coloratura which was brilliantly delivered. Carlo Rizzi presided in the pit with a great sense of control and style, bringing out the rich textures of Iain Bell's score. 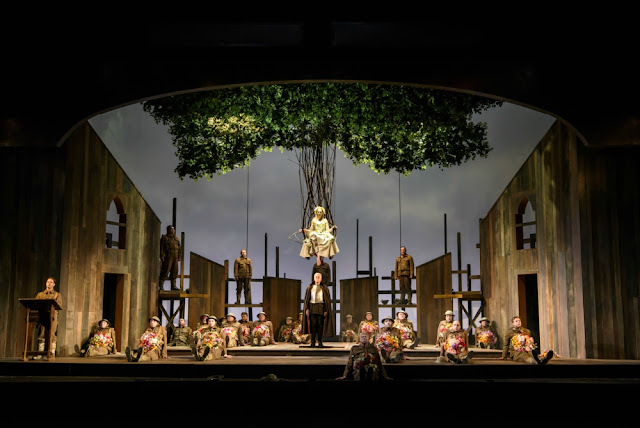 As ever the WNO chorus delivered a strong performance, and it was good to see the way Bell had deliberately written the opera to give opportunities to both the women's and men's choruses, opportunities that were brilliantly taken. Overall, I was more struck by the problems inherent in adapting David Jones' poem and the idiosyncrasies of David Pountney's staging to really get to grips with Iain Bell's score. Luckily it is being broadcast on BBC Radio 3 tonight (2 July 2016) and so will be available on listen again to help us to appreciate its considerable beauties. It is also possible to watch it on The Opera Platform website. Tying works of art to particular anniversaries is a tricky thing. 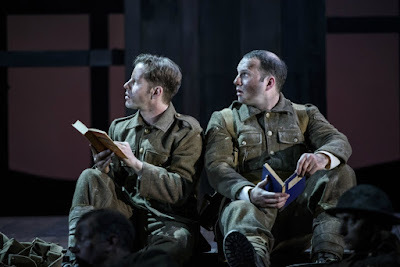 I feel that Iain Bell's opera would benefit from further outings, different productions but worry that this will not happen because it is so linked the commemorations for 1 July 2016.